I'm currently taking the beginning knitting class here and was feeling rather confident (thanks to Kim's excellent instructions) so I thought I'd try out a pattern for a drop stitch scarf ( found here: http://www.ravelry.com/patterns/library/drop-stitch-scarf-2). Not bad for only knitting for 5 days! Not bad, indeed! You look like a natural, Jennifer. Congratulations on your new skill! Do you like the drop stitch scarf? I have a Clapotis going and am not liking it very much. Your pattern looks very simple with those short drops instead of super-long ones like I'm tugging at. I do like it. It is fairly easy, as the pattern name indicates. Well done! I made a 1-color scarf with that pattern recently, but I'm really liking how your color changes are coming out. It's variegated yarn. 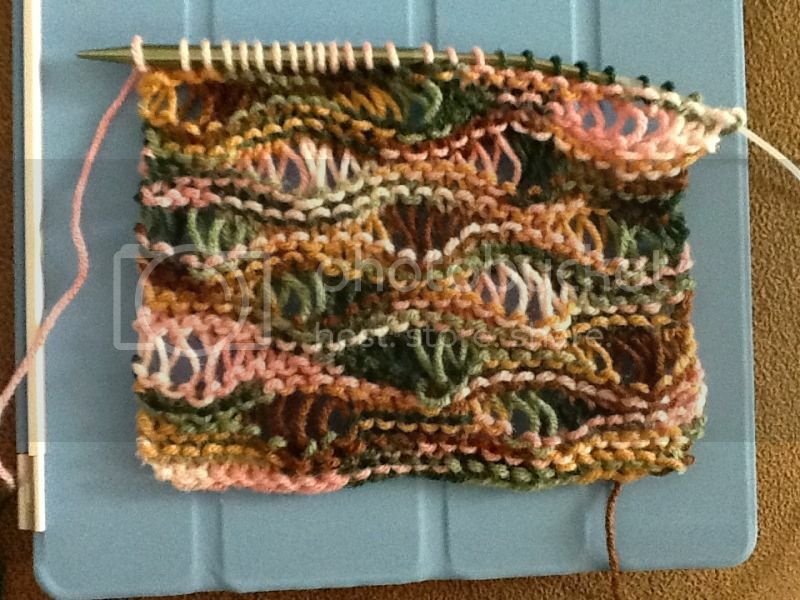 On the ravelry page for the pattern, it said it is a wonderful pattern for variegated yarn. I would have to agree! Ooh, very nice! I've being eying either clapotis or another drop stitch scarf myself, which stitch I've never made. I'm so glad you're enjoying the class. I took Tunisian crochet with Kim here on the 'ville, and she makes you feel so confident that yes, you can do it! 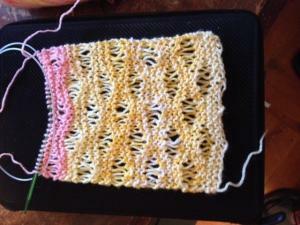 I just learned this stitch too making a scarf it is so much fun to do. I watch the stitch on you tube and that help me a lot. Your doing a great job with your scarf love the color you are using.i plan to learn many more new stitches in knitting this year is my goal. Your scarf looks really good. I also made that pattern with a variegated yarn recently. 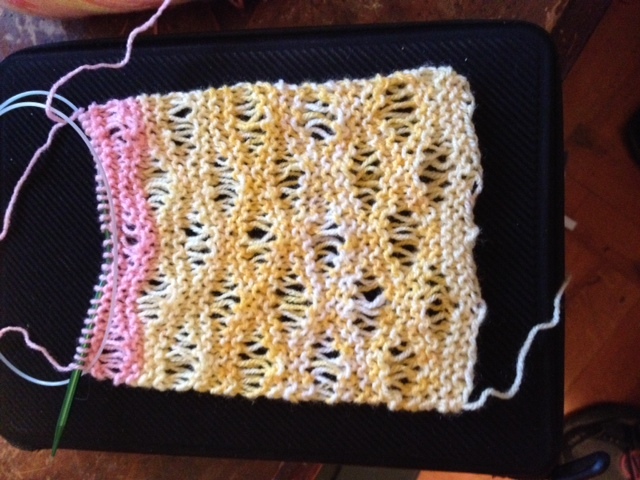 I am a super slow knitter and I liked the fact that the drop stitches made it "grow" quickly. Love this stitch so much making a second scarf it gets really easier as you go along. Great job! Yay for new knitters! Found this post and thanks for the link to the pattern. I have just got the first 8 rows knit and I'm loving it. I had to go to youtube to figure how to drop the YO. I've been knitting a week so this is very new to me. I didn't have any dk yarn on hand. Might have in my storage unit. So I am using Bernat baby jacquards in berries and cream. And using a 6 circular needle. I will post a pic when I get more done. Going pretty quickly too. Heres what it looks like so far, this is turning out pretty cool, cant wait to be done and wash and block. Bottom looks kinda funky, still haven't gotten the hang of the first row after cast on, after that it seems to go better. Loving the pattern!